SPANISH team Hispania Racing enter their third season in Formula One, having had very little to show for its first two years. Although the team is believed to be in a slightly more secure financial position than it ever has been, another season of struggle is widely predicted. 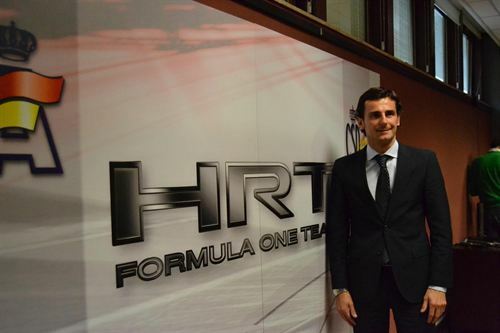 HRT has needed the money to financially compete in recent years. It started off in 2010 with Bruno Senna and Karun Chandhok driving the car. Since then, it has been like a revolving door, with the likes of Sakon Yamamoto, Christian Klien and Vitantonio Liuzzi all trying their luck with no result. This season, it will be interesting to see how the team cope without the services of technical director Geoff Willis, who has joined the Mercedes GP technical dream team. However, they have plans to become an all-Spanish unit, with talks underway for a new factory headquarters near the Valencia Street Circuit. 40-year old Pedro de la Rosa will lead the team this season. The veteran Spaniard, who has raced for Jaguar and Sauber in the past, announced his decision to return to racing back in November. It was something of a surprise, considering the constant struggle for midfield drivers to earn spots on the 2012 grid. However, what de la Rosa will bring to the team is a wealth of technical feedback and car knowledge from his many days as a reliable test driver for McLaren. Plus, he has brief experience of being in a backmarker team from his debut season with Arrows way back in 1999. He is definitely a safe pair of hands. de la Rosa’s partner will be the Indian, Narain Karthikeyan. Karthikeyan has probably earnt his drive through a wealth of sponsorship backing over talent. He raced for the team last year, only to lose his seat to Daniel Ricciardo after last year’s European Grand Prix. He returned for the inagural Indian Grand Prix and raced well. Although Karthikeyan’s wild 2005 days with Jordan were tamed easily last season, he struggled badly and made little impression on a Sunday afternoon. He will do well to achieve much in 2012 too; more likely to upset top drivers with his lack of attention to use of mirrors than quick lap times. You have to admire HRT’s desire to continue and they have achieved creditable reliability in their first two seasons, but it is difficult to see anything else again in 2012, other than another battle for survival. MARUSSIA Racing have been forced to delay running their new 2012 car after failing an FIA crash test. The team, formerly known as Virgin Racing, is understood to have failed the 18th and final part of the vigorous safety tests, to ensure that any car passing the crash regulations. The MR01 had been due to make its bow in this week’s Barcelona pre-season test, which begins on Thursday. This means that the team will be forced to sitout the final test, having ran a modified version of its 2011 car in Spain last week. Consequently, it won’t make a bow before Friday practice at the Australian Grand Prix. This is dreadful news for French rookie Charles Pic, who will arrive in Albert Park with no running of the new car and next to no running, with just two days track experience under his belt. Marussia is a Russian sportscar marque and will be hoping to make a move away from the back of the grid that Virgin failed to do. 14th is the team’s best ever finish so far, as it enters its third season in the sport. Fellow backmarker team HRT has also had issues with crash tests, but is believed to have passed the last test at the weekend. The Spanish team hasn’t confirmed whether it will test this week yet. Meanwhile, both Ferrari and Red Bull Racing have been forced to alter their testing plans. Both teams had plan to run at the Circuit de Catalunya between Friday – Monday, but it has broken article 22.4 of the FIA sporting regulations, which forbids testing the week before the first race. Instead, they will run like everyone else, between Thursday – Sunday, with Mark Webber, Sebastian Vettel, Felipe Massa and Fernando Alonso all taking it in turns to do final system runs before Australia. SAUBER continued the trend of confusing the formbook, as Kamui Kobayashi ended up fastest on the final day of testing this week in Barcelona. Although the Swiss team admitted afterwards that his fastest run was as a qualifying demo, it leaves many fans and experts still confused about a potential running order going into the Australia season opener. Anderson went on to predict that he still thinks the Red Bull is going to be the car to beat. Kobayashi set a 1.22.312 today, not only ending quickest, but setting the fastest lap time of the week. It was slightly better than Pastor Maldonado’s metoric effort yesterday, but the Venezuelan continued his purple patch by going second fastest. Paul di Resta completed a very surprising top three in the consistent Force India, as Jenson Button, Mark Webber and Felipe Massa spent another day gaining more mileage and not end up being too concerned about setting a fast time. Six drivers did over 100 laps today, but Marussia never left the garage. 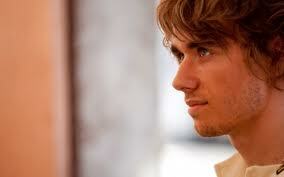 Charles Pic was sidelined for the day after an early discovery of a damaged suspension component. The team will launch their 2012 model next week. Meantime, it seems to have emerged that HRT have some issues with their 2012 car. Their non-appearance this week indicates that the new car has failed the mandatory FIA crash test. The final pre-season test will be held again at the Circuit de Catalunya, beginning next Thursday. SEVEN days of official pre-season testing have taken place and now, seven different drivers have ended days topping the timesheets. 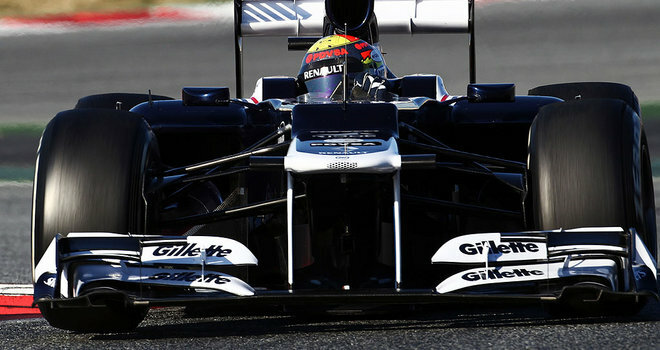 The trend was continued in Barcelona today by a surprise package, in the form of Pastor Maldonado. Maldonado, who only scored one point in a trying rookie season last year, set a searing pace of 1.22.391, the fastest time of the week. To prove how quick it was, second fastest Michael Schumacher was nearly a full second behind the Venezuelan in his Williams Renault. He joins Nico Hulkenberg, Sebastian Vettel, Fernando Alonso and Schumacher amongst others to end a day as the fastest driver. Although some will say that Maldonado did his time on fresh rubber and low fuel, he was very quick all day and dominanted the afternoon session, with a string of fastest laps. Upto this point, the Williams chassis had shown excellent reliability, but Bruno Senna, Maldonado and Juan Bottas had failed to trouble the pacesetters in any test so far. Many of the other teams still seem to be experimenting with car setups and race simulations, but Schumacher will be delighted to not only end second quickest, but to do 127 laps, without any reliability glitches. The new Mercedes GP looks like a dangerous contender from early reflections. Caterham encoutered more suspension problems this morning, but Vitaly Petrov bounced back to get some useful track data and 70 more laps. However, it did give Marussia a bonus, as Timo Glock was able to end up with a quicker overall lap time in a 2011 car. Marussia won’t reveal their 2012 challenger until next week. Meanwhile, Lotus have applied for an extra day of private testing after the problems on Tuesday that curtailed their action this weekend. It is believed that all the teams have provisonally agreed to this, although it is still awaiting final confirmation from the FIA. This week’s activities conclude tomorrow, with one more week test in Barcelona before the teams fly to Melbourne for the season opener in a little over three weeks time. 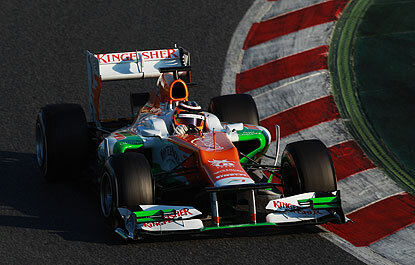 FORCE India’s fantastic winter continued today on the second day of pre-season testing at the Circuit de Catalunya. Nico Hulkenberg, who is returning to the sport after being a frustrated spectactor in 2011, set the pace in Spain. Hulkenberg gave his team some crucial data, pounding around Barcelona for 112 laps, setting a quickest time of 1.22.608. Although his time was on super-soft tyres, the new Force India looks consistent and fast, which bodes well for the early season events. Hulkenberg edged out Sergio Perez today, who showed some pace from Sauber that has been seriously missing in early tests. Like Hulkenberg, Perez recorded his best time on super-softs, but still was an impressive second quickest, just 0.040secs shy of the German’s quickest time. Having set a benchmark yesterday, Sebastian Vettel and Red Bull looked at race simulation today, but the champion was the man to beat again until the late efforts from the top two. Vettel was third fastest, his best today was a 1.23.056. Fernando Alonso was next up, but a super-soft tyre run slower than Vettel’s on the prime tyre suggests Ferrari have a mountain of work to do before the first race in Australia on March 18. Like Vettel, Lewis Hamilton focused on race simulation work today, doing 120 laps and coming sixth on the timesheets. However, the Brit later told BBC Sport that he is encouraged by the hidden pace McLaren have at the moment. Jenson Button, flying in from presenting an award at the BRITS last night, will take over driving duties tomorrow. Likewise, Mark Webber and Felipe Massa will be putting in the miles over the next two days, after Vettel and Alonso’s efforts at the start of this test. However, Lotus have had to withdraw from the rest of this week’s testing. They went home yesterday, after Romain Grosjean felt uncomfortable with an unspecificed chassis problem. However, team principal Eric Bouiller is convinced they’ve fixed the problem. He said to BBC Sport; “On the positive side, we have quickly identified the issue with the chassis and our design office has already devised a solution. We will be present at next week’s test in Barcelona.” However, it leaves Lotus just four more days of running before Melbourne, so they are now seriously on the backfoot. 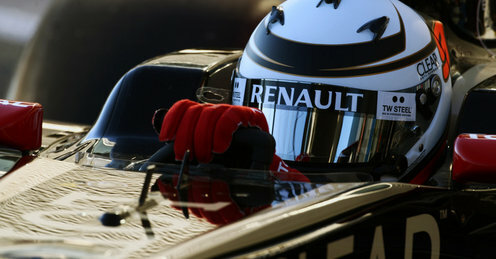 THE second Formula One pre-season test started today in Barcelona and Sebastian Vettel means business. The double world champion, aiming to become only the third driver to win three titles in a row dominated the opening day in Spain, outperforming his other main rivals. Vettel took the fastest time this afternoon, after countryman Nico Hulkenberg made the early running this morning. Hulkenberg, who lost time in the Jerez test through no fault of his own, looked comfortably at ease in a Force India that continues to set some consistent lap times. His quickest today was a 1.23.440, only 0.2secs behind the formidable Red Bull/Vettel combination. His total of 97 laps was useful mileage too. Lewis Hamilton was third fastest, continuing McLaren’s quiet start to the winter programme, although their new car looks far better than the predecessor did at this stage last year. We also got a view of the new Mercedes GP W03 today and it is likely that the team will use this test to establish reliability and durability on long runs, rather than outright pace. This makes Michael Schumacher’s effort, sixth fastest and less than a second shy of Vettel’s benchmark of 1.23.265 all the more encouraging. However, it was a difficult day for both Caterham F1 and Lotus Renault. Caterham’s Heikki Kovalainen stopped out on track with a suspected track rod failure. Kovalainen was only in his ninth lap of the day, but further checks seemed to hint that it wasn’t a day-ending problem and the Finn managed another half an hour of running at the end of the day. Vitaly Petrov will make his debut in the car tomorrow. Meanwhile, Lotus packed up at lunchtime after Romain Grosjean did just seven laps, and complained of chassis problems. The team are flying back the car to factory headquarters as a precuationary measure tonight and also aim to run with Grosjean again tomorrow. However, this major headache could have a knockback on their entire week programme at the Circuit de Catalunya. THE Williams swinging door of arrivals and departures continues in the build-up to the Grand Prix season. Their former driver, Alexander Wurz, is returning to the Grove based team as a driver mentor. Wurz, who turned 37 last Wednesday will help out Bruno Senna and Pastor Maldonado in the 2012 campaign, as the team attempt to recover from a diabolical 2011 season, which saw them pick up a meagre five points, Williams worst season since they became Williams Engineering back in 1978. Alex was Williams test driver in 2006 and raced for the team in 2007 – finished third in that season’s Canadian Grand Prix. Wurz also raced at Benetton for four seasons in the late 90s and was an established test driver for McLaren between 2001-2005. The Austrian will combine the role alongside part-time roles as a pundit for Austria television, a new deal on Toyota’s return to sportscars and an occasional position as a driver steward for the FIA. His addition to the backroom staff will surely give Williams a much needed push in the right direction as the teams head to Barcelona for the second pre-season test, which begins tomorrow. VIRGIN Racing is no more and realistically, the team has faced a losing battle in its first two Grand Prix seasons. From the moment former technical director, Nick Wirth admitted in Australia 2010 that the team didn’t have a big enough fuel tank to finish races, any momentum that might have been built up vanished. Since then, it has been a real struggle for the team, as they haven’t troubled the points scorers, continued to fall away from Lotus (now Caterham) and almost be outpaced by the Hispania team on more than a sporadic basis. Due to better race results from HRT, Virgin, managed by former Manor motorsport boss John Booth, has finished bottom of the constructors championship. This year, Marussia is the name they will be known as – the Russians involved in their second year of involvement having come onboard in 2011. Former Renault technical director Pat Symonds has been acting as a consultant, whilst serving a ban for his part in the 2009 race-fixing scandal. It will be interesting to see if his impact will have any movement in the team’s progress. At times, former Toyota driver Timo Glock has produced absolute miracles and other occasions, frustration has led to the German not producing what is required of him. Considering he has finished in podium positions in the past, the project has been a failure in his career and frankly, a waste of his talent. Nevertheless, Timo has stayed on for a third successive year, which indicates he does has some faith in the operation. He has another new team-mate this year, as Frenchman Charles Pic moves into the no.2 seat. Pic finished fourth in last year’s GP2 series, winning a couple of races although the rest of his quantity is unknown. He replaces Jerome d’Ambrosio. Many predict that Marussia will face another season of struggle. This year is make or break to see if they can make radical movements or be left trailing again at the back of the pack. THERE will be no Italian drivers on the F1 grid in 2012 after Jarno Trulli was axed on Friday by the Caterham Formula One team. The veteran has been, as expected, replaced by Renault refugee Vitaly Petrov. With less than a month to go before the green light in Australia, the announcement still comes as a surprise, considering that Trulli had taken part in the first pre-season test at Jerez a fortnight ago. Petrov, who scored his maiden F1 podium finish in Melbourne last season, finished tenth in the driver’s championship and is about to start his third full season in Grand Prix racing. The Russian’s form faded badly in the closing stages of 2011 and an extraordinary outburst in the press aimed at Renault after the Abu Dhabi Grand Prix sealed his demise from the Enstone team. Nevertheless, he has shown his capabilities at this level and will give Heikki Kovalainen more of a fight at the Caterham unit than Trulli ever did. The move all but ends Trulli’s unspectacular Formula One career. The Italian made his F1 debut for Minardi in the 1997 Australian Grand Prix, but moved to Prost mid-season to replace the injured Olivier Panis. He then sensationally led the Austrian Grand Prix, but struggled to relive his early potential. Inconsistency dogged him throughout, with the tendency to qualify brilliantly, only to drift away on raceday. Trulli raced for Prost, Jordan, Renault and Toyota – winning just once, the 2004 Monaco Grand Prix. He joined Lotus (as formerly known) in 2010, but has struggled with the chassis in the last two years, consistenly outperformed by Kovalainen. 13th place in last year’s race at Monaco was his best finish for his last F1 team. 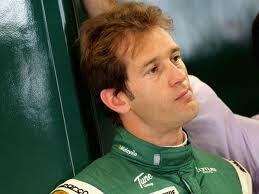 Trulli’s relationship seemed to deteriorate because of his failure to cope with a power steering set-up. He was even replaced at the Nurburgring by Karun Chandok last season, which indicated that things weren’t all too well. Trulli’s exit means there will be no Italian driver on the F1 grid for the first time since 1969. 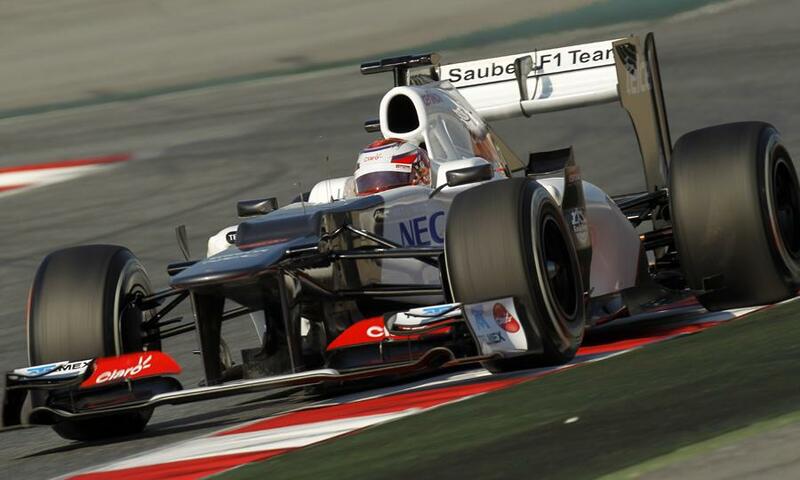 THIS will be the third year without works support for Sauber, since BMW withdrew from the sport at the end of 2009. Resources have always been limited for the Swiss team as an independant, but Peter Sauber will never give up. The question is, can they make a significant jump up the grid in 2012. The recent departure of technical director, James Key has to been seen as a blow to the team’s hopes. Although he would have had significant input on the new car, there is a worry that a lack of progress could see the team stagnate or even slip towards the back of the midfield. Despite finishing fourth in the 2001 championship on a shoestring budget, Sauber have a habit of starting a season strongly, then falling backwards as the year progresses – even during the BMW years. Development is something they keep getting outraced by and therefore, it must be frustrating for the drivers, knowing that despite their hard efforts, it might lead to very little. At least the drivers remain for 2012 and it is a talented line-up. Kamui Kobayashi is spectacular to watch and defintely, Japan’s greatest racing driver in Formula One. Kobayashi went off the radar in the middle part of 2011 and probably didn’t establish himself as a natural team leader. However, his tenth place in Abu Dhabi and ninth place in Brazil was crucial to Sauber staying ahead of Toro Rosso in last year’s constructors championship. Kobayashi has a tendency to either be breathtaking or lacklustre. He needs to make a breakthrough this season and become a more consistent driver for the whole season. Once again, he will be partnered by the Mexican, Sergio Perez. Perez’s form was one of the highlights of 2011. In his rookie season, he often put Kobayashi in the shade and many fans, including myself had him down as rookie of the year, despite Paul di Resta’s natural consistency at Force India. He was tough to pass, solid in qualifying and despite making some basic errors in judgement regarding the rules, showed a lot of potential which has him earmarked as a future Ferrari driver. Sadly, Sergio’s 2011 season will probably be remembered more for the horrifying accident he had in qualifying for the Monaco Grand Prix. However, he has his place on the grid on merit, not just through being wealthily backed by Telemex, one of Sauber’s key sponsors. For me, Sauber need some form of investment, even if it isn’t from a manufacturing background. The team is good and will probably challenge for lower points finishes on a regular basis, but they only seem to do that and not threaten for serious points results. It will be upto Kobayashi and Perez to deliver and if they really do have lengthy careers in the sport, outdrive the car’s capabilities on a regular basis. We’ve seen what’s happened to the likes of Jaime Alguersuari, Vitaly Petrov and Adrian Sutil – if you don’t look like a future winner, you are more likely to miss out on a drive. I’m afraid Key’s abrupt departure will probably mean another season of mediocrity for a popular outfit. 2012 will be a very interesting season for Scuderia Toro Rosso. Their decision, controversial to some, to sack Sebastian Buemi and Jaime Alguersuari before Christmas was very interesting. 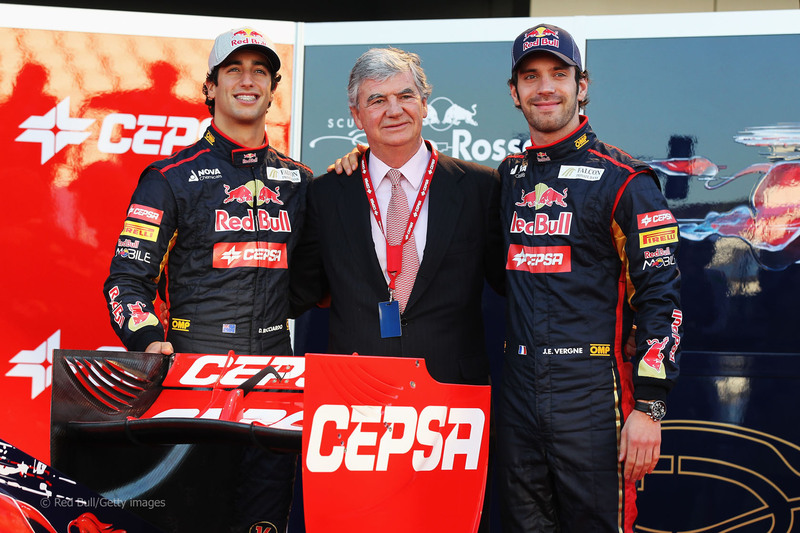 Buemi and Alguersuari both put in many notable and solid drives in 2011, so there was a degree of surprise that both drivers got the axe from team principal Franz Tost. Tost, who has fired Scott Speed and Sebastian Bourdais unceremonisuly in the past said that both drivers simply didn’t have the capabilities to win races and move the team up the grid. Although Buemi had been with the outfit since 2009, Alguersuari was considered unlucky, especially as he raised his game in the second half of the season and still only 22, was proving a solid, if unspectacular driver at Grand Prix level. He has been left in limbo by the axing, whilst Buemi at least did become Red Bull’s reserve driver. Despite this, the Swiss has been recently signed up by Toyota for their Le Mans programme, so a career in endurance racing beckons. Consequently, it is a case of out with the old and in with the new at the Italian team. Two youngsters will spearhead their attack, in the form of Australian Daniel Riccardo and Frenchman, Jean-Eric Vergne. Vergne, 21, is the 2010 British F3 champion and is one of the hottest properties from French motorsport since Jean Alesi burst onto the F1 scene back in 1989. Last year, he was runner-up in the Formula Renault series, so although naturally groomed as part of the Red Bull Young Drivers programme, his lack of GP2 or GP3 experience could be seen as a worry. Vergne did star in the Abu Dhabi Young Drivers Test last November and looked quick in practice sessions in Abu Dhabi and Brazil at the back end of last season for Toro Rosso. However, it is a gamble to throw him straight into Grand Prix racing and I hope it will pay off for his career. Riccardo has been prominent for a while and already has a taste of Grand Prix experience. He made his debut for the Hispania Racing team at the British Grand Prix last season. Having outpaced the experienced Vitantonio Liuzzi on a regular basis, the Australian’s promotion into the Toro Rosso is seen as a natural progression. Perhaps he is the solution that Red Bull are looking at, when Mark Webber eventually decides to stop competing in F1. However, he has only taken part in 11 races himself, so it will be a huge test for Riccardo, as he will be expected to be team leader and show Vergne the way. Early testing signs show plenty of promise, but pressure will be on the drivers. Tost will expect Toro Rosso to at the minimum, beat Sauber in this year’s constructors championship and challenge for a top six constructors placing. If the drivers don’t perform from the start, the team boss might regret his gamble in getting rid of proven drivers, Buemi and Alguersuari. THE dynamic of the 2012 Mercedes GP and how quick it goes will be interesting when it is launched next week. That is because for the second day running, the 2011 machine ended up top of the timesheets, this time in the hands of Nico Rosberg. 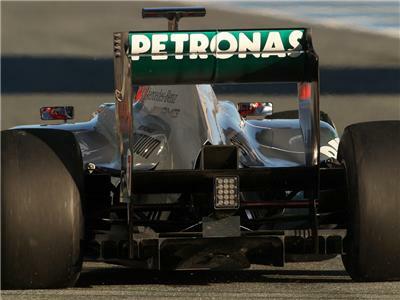 Rosberg completed 118 laps, setting the fastest time of the week so far in Jerez, with a time of 1.17.613. It dislodged GP2 champion Romain Grosjean from the top. Grosjean, taking over from Kimi Raikkonen in the Lotus Renault team was quickest this morning and certainly looked comfortable all day, as Lotus solid start to winter testing continued. This was the day when some of the major players took to the track for the first time. Sebastian Vettel, Lewis Hamilton and Fernando Alonso all returned to action following the winter break and both Vettel and Hamilton stayed out of trouble, setting consistent times and getting good mileage under their belts. The world champion was third fastest, only 0.2secs quicker than the Brit in his McLaren. Alonso was down in seventh on another very quiet day for Ferrari. His cause wasn’t helped by a hydraulic problem, which left the Spaniard in the garage for the first two hours this morning. With vibes coming from within the media of Felipe Massa saying that a lot of work is required, the Scuderia already look on the backfoot. It wasn’t quite as bad as Jules Bianchi, who spun his Force India into the barriers early this morning, seriously disrupting what had been an excellent week for the team so far. Bianchi, who is reserve driver for the Silverstone based team told Sky Sports; “I made a small mistake on my second run. The tyres were a bit cold and I spun into the gravel and touched the wall with the right rear wheel. It was not a very big impact, but it caused some damage. I’m very sorry because my mistake has cost the team a lot of time and effort.” He would have to apologise to Nico Hulkenberg, who had been due to make his 2012 bow this afternoon, but was left to twiddle his thumbs, whilst the team flew out replacement parts from their UK base. Hulkenberg has to wait until tomorrow now to make his first impact of the season. One more day of this test remains and if the 2011 Mercedes, which let’s be honest, was a poor car has ended on a high, expectations will rise of a potential assault on the championship if these times are anything to go by. MICHAEL Schumacher rolled back the years as he was the man to beat in the second day of F1’s first winter test in Jerez. The German, running a revised 2011-spec Mercedes GP was quickest, setting a time of 1.18.651 this morning, which no-one could match in the afternoon segment of running. However, Red Bull’s new challenger looks ominous as Mark Webber bounced back from limited running yesterday to set a competitive 1.19.184. Webber was the fastest driving a 2012 car and over 0.4 secs quicker than the next 2012 runner, Daniel Ricciardo, in a Toro Rosso. Testing times are always difficult to judge, due to various set-ups, fuel loads and the need to attract sponsors in a gloomy economic era. 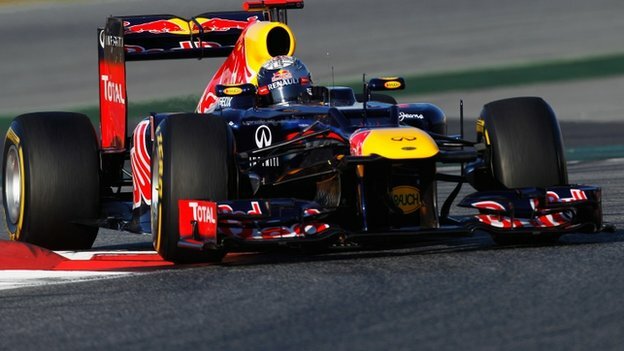 However, the new Red Bull is looking like an early pacesetter, as we await Sebastian Vettel’s first run in the car. Lewis Hamilton has not been seen in his new McLaren yet and once again, his name is being mentioned in other areas of the press. American journalists are speculating that the 2008 world champion has got back together with pop singer Nicole Scherzinger. This is after a video was uploaded of the pair holding hands and walking down the street, both looking reluctant to talk to the paparazzi. On a legal side, Hamilton might be asked to testify in Germany, as Adrian Sutil has launched an appeal against his 18-month suspended sentence he received last week for GBH. Whilst Hamilton makes headlines off-track, the new McLaren continues to make little impact on the testing timesheets in the hands of Jenson Button. Ferrari have also made a quiet start, working more on set-up components with Felipe Massa rather than set blistering lap times. Despite an off-track excursion this morning, Kimi Raikkonen did another 117 laps today and ended up in the top five on his comeback to the sport. Lastly, Heikki Kovalainen produced a consistent day for Team Caterham, as technical director Mike Gascoyne said on Twitter; “Really good day of testing today, 139 laps and lots of long runs on the tyres. Also very succesful first day with KERS on the car.” 11th fastest might not suggest much, but the Caterham sounds like it has a good baseline for the upcoming campaign. Testing continues tomorrow. IT MIGHT have been a chilly start to proceedings, but Formula One 2012 breathed into life, as the cars took to the Jerez circuit this morning. This is the first winter test of three before the Australian Grand Prix on March 18 and gives the drivers their first opportunity to drive the new cars, new Pirelli tyres and adapt to new technical regulations, such as the banning of blown diffusers. Due to new components arriving from the factory in Milton Keynes, Mark Webber could only manage eight laps before lunch, but still set the fifth fastest time. Paul di Resta was second fastest in the new Force India, 0.1 secs behind Raikkonen. Nico Rosberg was an impressive third fastest in a modified version of last year’s Mercedes GP. Mercedes won’t reveal their 2012 challenger until next week. The German has handed the driving duties over to Michael Schumacher this afternoon. McLaren and Ferrari had quiet mornings, with Jenson Button and Felipe Massa failing to trouble serious times. All teams, excluding Mercedes are only running one driver per day. Marussia Virgin are the only team not present at this test, with Mercedes GP and Hispania running modified models of last year’s cars. It is very early to predict how the season or even the week will unfold, but there was certainly no sign of rustiness from the Iceman, Raikkonen this morning.